U.S. Rep. John Culberson, a Republican from Houston, is including language in a foreign relations bill urging the State Department to negotiate with Mexico for the return of the only flag on the Texian side known to have survived the Battle of the Alamo in 1836. It is called the New Orleans Greys flag, carried by two companies of volunteers from the United States who fought on behalf of Texas’ independence. The flag was taken by Mexican General Antonio Lopez de Santa Anna after the battle and forwarded to Mexico (Santa Anna went on to victory at San Jacinto) where it has remained for the last 181 years. It is held in the Museo Nacional, or I guess it is. I first saw the flag there in a big glass case beside several other Lone Star flags captured in battle. A few years later I revisited the spot and the flag was gone. “It’s being restored,” I was told. Three years later I was told the same thing. This brings us to an interesting tale of several arms and a leg, and the plot for a good movie. The flag is not the Lone Star flag we use today, but is 4 feet by 6 feet, sort of dirty gray in color and made of silk. 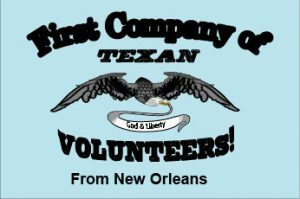 Across the top of the banner are the words: “First Company of TEXAN” then there is an eagle holding a banner reading, “God & Country.” At the bottom is: “Volunteers! From New-Orleans.” The flag was presented by a pretty young girl to the New-Orleans Greys when they entered Texas in 1836. They were headed for a mission in San Antonio. It is known that at least two other flags were taken into the Alamo, but at dawn of March 6, 1836, when the last assault began, the Greys’ flag was the only one flying. It stood atop the barracks and so infuriated the attacking Mexicans that three different color sergeants of the Jimenez Battalion tried to climb up and rip it down. Each one was killed. Finally, Lt. Jose Maria Torres of the Zapadores Battalion made it to the roof, ripped down the Greys’ flag and, with the aid of Lt. Damasco Martinez, ran up the Mexican flag. Both were killed, but the Alamo flag never flew again. Later, Santa Anna sent the flag and a note back to the Mexican government explaining his victory, and his huge losses. He wrote, “The bearer takes with him one of the flags of the enemy’s battalions, captured today.” He goes on to write that the “New-Orleans” on the flag clearly shows “the true intention of the treacherous colonists . . . who came from the ports of the United States of the North.” The flag stayed in a drawer in Chapultepec Castle for 98 years, until 1934, when it was discovered. But it stayed put until the late 1960s when Walter Lord, an American historian, pulled open the drawer and found the Alamo flag with the note still pinned to it. Since then Texas has tried everything to get it back. A special effort was made in 1986 during Texas’ Sesquicentennial celebration. Mexican officials said that the flag was too fragile for travel. There was a plan to trade the death mask of Pancho Villa for the flag. But the mask had been returned to Mexico a short time before by its owner. In 1991 the Texas Legislature asked President George H.W. Bush to make the flag’s return part of the NAFTA negotiations. Again, no luck. (We lost some bargaining chips when, during the 1950s, the United States unconditionally returned 69 captured battle flags to Mexico.) In 1994, State Sen. Carlos Truan of Corpus Christi said that the Mexican consul in that city, Armando Beteta, raised the possibility of trading the Alamo flag for three Mexican battle flags captured at San Jacinto. Nada. One group of Austinites reportedly discussed paying as much as $36,000 to have the flag stolen or otherwise obtained outside official channels, i.e. a bribe, or hire a cat burglar, maybe trade it for Santa Anna’s leg. But the Napoleon of the West had an artificial leg. He had once again become president of Mexico (seven times), and during a battle in the Mexican-American War, the 4th Illinois Infantry surprised Santa Anna, who fled without his cork and wooden leg. The soldiers seized the leg as a trophy and brought back to their home state, where it toured at county fairs before ending up at the Illinois State Military Museum. Mexico’s repeated requests to repatriate Santa Anna’s fake limb have been denied. So we buy the leg from Illinois, which is almost broke and in desperate need of money, then trade it to Mexico for our flag. Or my idea: The heist movie. A Ross Perot-like mogul, who explains he already has the Declaration of Independence, Constitution, Magna Carta and Gettysburg Address, (“the ‘real ones’ are copies”), hires Raul “The Cat” LeSneak to steal the Alamo flag. Mexican Detective Jose Garcia is out to prevent it. Midnight roof tops, a fake flag, the car chase, an O. Henry ending. Pass the popcorn.